I told myself that I would go easy while I was cleaning up the garden, so I could leave shelter and food for the birds, but I started weeding and pruning and pretty soon things were looking kind of bare. I've spent the last couple of weekends slinging compost, dressing all the beds in the hope of improving the soil. I had a yard and half delivered; at first I thought it was too much, now I'm thinking it wasn't enough. We were going to broadcast it on the lawn, put it in the raised beds, and apply it under the rhodies, even though we don't want to encourage them. I'm hoping this application won't interfere too much with self-sowing perennials like forget-me-not. I planted some this year, after falling in love with them on a garden tour. When I pulled them out of the ground I made sure to give them a good shake to disperse the seeds. Hopefully I didn't apply the compost too heavily to let them come back. After appearing in new places, failing to bloom, and hiding my beautiful rust-colored ninebark behind six-foot shoots, I decided to dig out the nootka roses. I've always loved this plant but it pops up in places like the Fred Meyer parking lot and I was stupidly worried that more experienced gardeners would look down on me for planting something that has been used so widely. It turns out it doesn't matter, people plant it because it's beautiful and takes full sun like a champ. 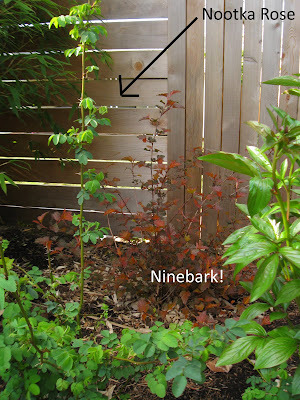 I think the chartreuse foliage on this one is going to look great against that dark red of the ninebark. In spring the peonies (on the right) have very dark green leaves and I think it's all going to play nicely off of each other. Ultimately I think I'll remove the peonies to a pot and plant something non-deciduous with very dark green foliage. Anybody have any ideas? 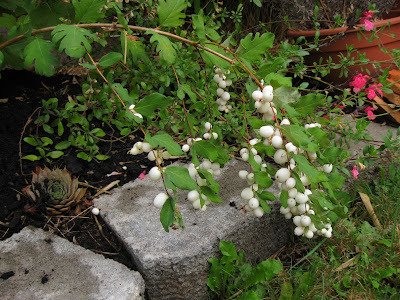 This is the first time my creeping snowberry has fruited and I'm in love. In July it bloomed with tiny hot pink flowers and now the branch is so weighted down with white berries it looks like it could snap.Congrats, snowberry! You get to stay. I bought my flowering currants from different nurseries, paying more for two that were supposedly var. King Edward VII. I didn't actually believe they were a different variety until they fruited. This one was trained poorly as a tree, thus it has a terrible shape, and yet it blooms better than any of the other currants and now it's loaded with black fruit. I was going to remove it but how can I remove something that is so loaded with bird food? I'm not confident in my pruning abilities to bring this back into my good graces. I might just go for it and prune it down to the ground after it blooms next spring. In comparison, this currant (presumably not King Edward VII), the first I planted in the yard as a wee seedling, has light blue fruit, a fantastic shape, and a reluctance to bloom. I'm hoping that was its youth showing and that it'll perform better next year. Learn from the nootka rose, currant! Gimme flowers or I'll cut you. But the really exciting news this weekend is that we finally bought a specimen tree for the back corner! 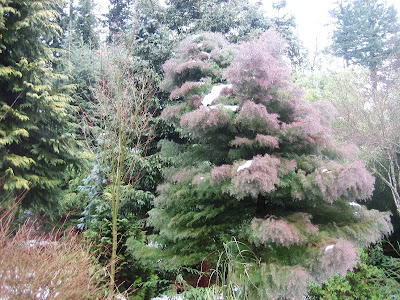 I went to Portland Nursery and spoke to several bearded men about what to plant. We finally settled on a Japanese Cedar, Cryptomeria japonica 'elegans'. It looks great in a garden with bamboo and it will top out at about 30 feet. My little guy. Grow, baby, grow! 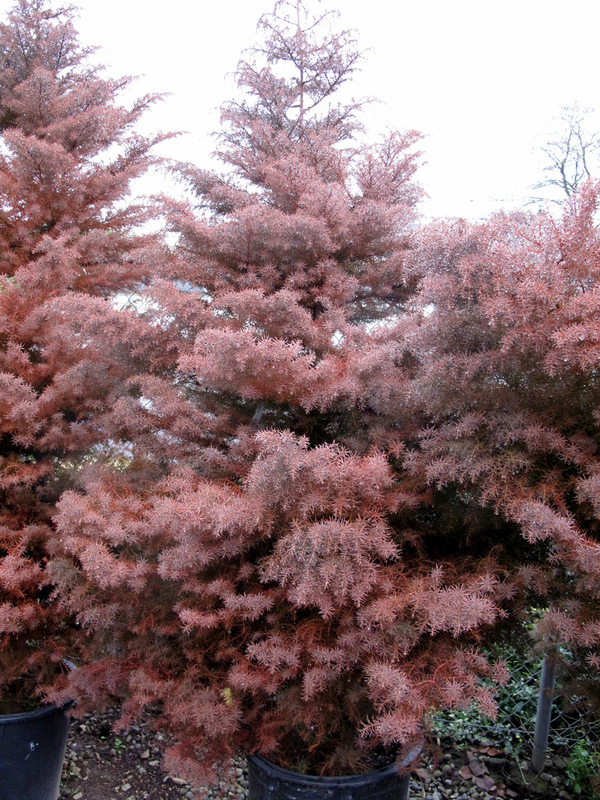 An older Cryptomeria. Photo by phildert. It's going to turn this color in the winter.
. . . and then flanked in front with a honeysuckle on the right . . .
. . . and a Mexican Orange on the left. And then this little baby is in front. It's Corokia cotoneaster, a bonsai variety of wire-netting plant. How freaking cool is this plant? Minus the hose and yard debris bin. I can't wait for everything to grow bigger and to intersperse these plantings with perennials, tulips, and lillies. I couldn't stop smiling all weekend--I'm so excited to finally have this area edited and on its way to being awesome. 1. This soil in this back corner is almost completely made of sand. It explains why my blueberries didn't do well here and why it smells like the beach when it rains. I think they must have dumped the extra sand here when they put in the patio slab that we removed. Or maybe a previous owner had a sandbox here? I worked wheelbarrow after wheelbarrow of compost here and the soil makeup still looked really sandy. 2. I will never ever stop finding buried concrete. My yard is apparently made of it. Nice yard!! Though, you have me worried now because we just ordered some Nootka rose for a hedge. Maybe we'll have to try and figure out a barrier. Sharon, I think they'll work great as a hedge! 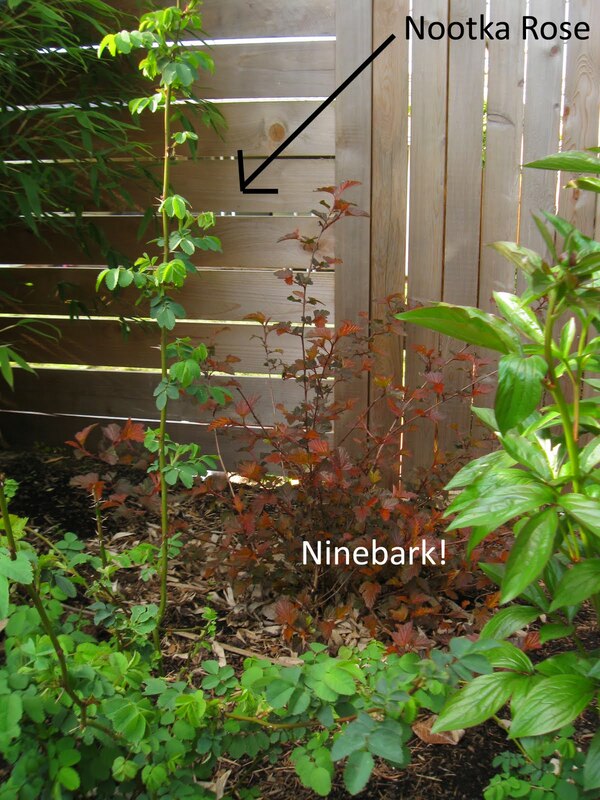 As a specimen plant, not so much. The good news is that they stayed away from other plants, only going where there was open space. So if you have other things planted nearby, I'd think you'd be okay. That Cryptomeria is GORGEOUS! Seriously, what a stunner! I've also never heard of the wire netting plant - that is so cool. I think I want to put one in the front yard, too! The wire netting plant was new to me too--I swear I've never seen it at Portland Nursery before.